It’s a question I have either asked or answered most of the days of my life. I still hear it in our raucous little voices, our bodies bursting down the hallway to the chair where our mom sat reading the latest Karen Kingsbury novel or (quite possibly) “resting her eyes.” Her answer could make our day (Ham and cheese casserole!) or summon a terrible sense of dread. (Meatloaf. Ugh.) These days Jason is usually the one doing the asking, his variety of inflections—hopeful, dubious, confused—usually reflecting the aromas currently emanating from the stove. Once I started cooking for myself, my answer was guided by three main factors: cost, taste, and prep time—usually in that order. I allowed myself a few splurges (no canned Parmesan cheese) but would otherwise defer to the cheapest price tag. Many meals consisted of convenience foods: a can of soup, a box of mac & cheese, a frozen pizza. My grocery list was created around (who else?) me: my taste buds, my budget, my schedule. I would have continued this pattern, unchallenged, had I not encountered a small stack of books on the subject of socially responsible eating. I was at the end of a Michael Pollan kick when I checked out The Omnivore’s Dilemma from our local library. 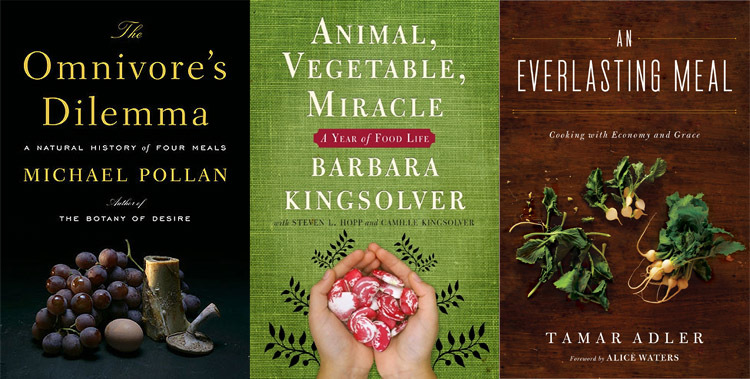 As a lover of food—all food, but especially the kind that comes from animals—I had thus far taken special care to avoid any book, film, or impassioned TED Talk that brought the morality of my eating habits into question. I love steak, I reasoned, and organic blueberries cost a fortune. Why add guilt to a habit I don’t plan to change? Pollan’s prose (I had just finished The Botany of Desire and Cooked) managed to get me in the tent. His observations on food—from the symbol-laden apple to the biochemistry of beer to the dramatic ritual of barbecue—gave the impression that he approached the subject as a student, not a judge. Ultimately I decided the pleasure of another 450 pages was worth temporarily feeling bad about bacon. I finished the final chapter feeling less judged than understood. Here was another soul stumped by the language of the grocery store: organic, free-range, non-GMO, whole grain…I bet you could name ten more. Pollan’s winding adventure through four meals—one from McDonald’s, one from Whole Foods, another from a holistic farmer, and one he hunts and gathers himself—explores his own ignorance of our food system and his quest to understand it. It ended not with a rallying cry to become vegan or boycott Wal-Mart, but with a reason to muse over the food we lift to our lips each day. I mused right through Tamar Adler’s An Everlasting Meal: Cooking with Economy and Grace—an impassioned call to enjoy eating and waste nothing—and Barbara Kingsolver’s Animal, Vegetable Miracle: A Year of Food Life, which follows a family’s year-long experiment to eat (with few exceptions) only food they grew, raised, or foraged themselves. By the end of this self-curated trilogy, I decided it was time to change the way I cooked. This meal reflects my new paradigms for buying and eating food. First: make and grow what you can. I bypassed a $4.99 tray of lemon poppy seed muffins on my last trip to Kroger, buying instead a $0.79 lemon that will, with other ingredients I have on hand, make twice the yield for half the price. Juice from that same lemon—mixed with a few tablespoons of oil, vinegar, sugar and salt—will dress our salads for dinner tonight. Our small patio is producing all the fresh sage, rosemary, oregano, thyme, mint and chives I need for 6-8 months of cooking, saving me the expense of all those tiny clamshell packages hanging above the carrots. A typical trip to the farmers market. 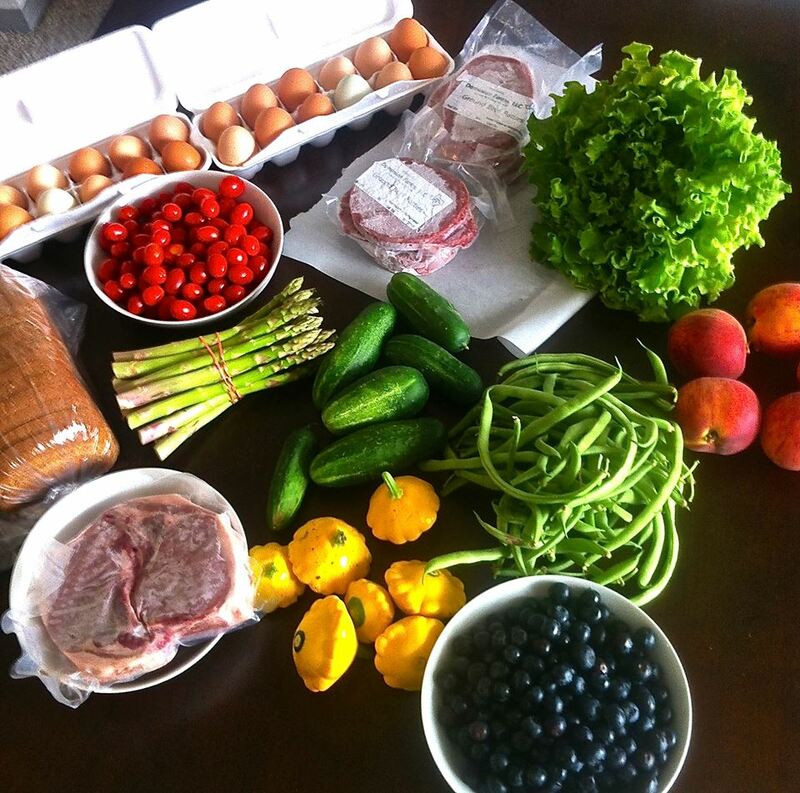 For $80 I purchased two dozen eggs, eight hamburger patties, two pork chops, a loaf of bread, two pints of blueberries, a pint of cherry tomatoes, five peaches, seven cucumbers, a pound of asparagus, a head of lettuce, and generous handfuls of green beans and squash. Third: use everything—bits of bacon, a handful of peas, a half-glass of Chardonnay left in the back of the fridge for a month. In this risotto, even the stock is formed from remnants, the same stalks and stems and peelings I once flushed down the garbage disposal. Because our meat is more expensive, I now parse it out over several meals; the same steak that used to serve dinner for one is now showcased in two meals (fajitas and a stir fry, for instance) that feed us both. The changes have been less burdensome than I expected, our meals incomparably more delicious, and my sense of community far richer. The joys of joking with my peach farmer, of trading recipes for hulled peas with others standing at the vegetable stand, and serving my friends “the best burgers they’ve ever had” far outweigh the small inconvenience of adjusting my menus. 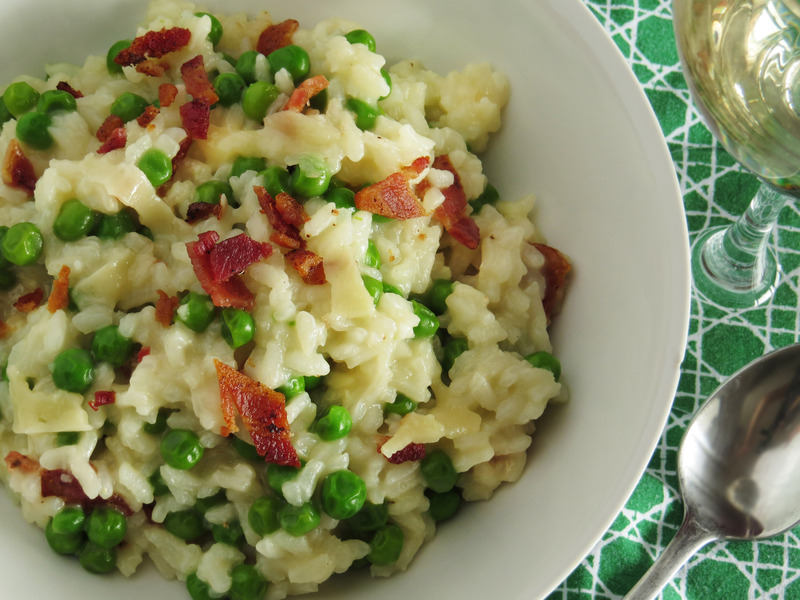 Even if you initially make this dish with Hormel bacon and canned Parmesan, I hope it will prompt your own food musings—for nothing inspires rumination quite like a pan of risotto in need of constant, thoughtless stirring. Want to learn more? All of these books are available on Amazon—and likely at your local library, too. Heat large frying or sauté pan over medium heat. Melt butter in the pan, then add onion and sauté for 3-5 minute. Add garlic and rice and cook 1-2 minutes, stirring frequently, until garlic is fragrant and rice looks slightly translucent. Add white wine, which will sizzle and foam a bit when it touches the hot pan. My risotto usually takes about 30 minutes to cook, but it could take up to 45 depending on the strength of your burner, the temperature of your stock, and the amount of liquid you add at a time. Around the 25-minute mark, grab a spoon and taste a few grains; once they’re slightly firm—but not at all crunchy—add the frozen peas to your stock with the next addition of liquid. Cook another five minutes, adding stock as needed, until peas are cooked and rice is cooked through. Remove from heat and stir in chopped bacon, 1/2 cup Parmesan, lemon zest, and reserved bacon grease (optional). Spoon into serving bowls and top with grated Parmesan. Place chicken in large stock pot. (If you used the recipe from this site, remove the lemon first.) Dump vegetables and garlic around the chicken. Add bay leaf and water to the pot until the chicken is covered by 1-2 inches of water. Toss in 1-2 teaspoons salt. Bring broth to a boil, then lower the heat. Simmer 4 hours or until broth reduces by about a third. The broth should be golden and your vegetables should not retain any of their own flavors. Remove the carcass from the broth and discard. Using a slotted spoon, fish out any large pieces of vegetables and discard them, too. Place the sieve over a large, clean bowl. Pour any remaining stock through the sieve to remove any smaller debris. *My friend Sean taught me this trick for discarded vegetables: whenever you’re left with the woody ends of asparagus, an odd wedge of onion, or broccoli stalks, stick them in a Ziploc bag in the freezer. When it’s stock time, just dump in the whole thing. Your stock will benefit from the complex flavors and you’ll never have forgotten vegetables rotting in your produce drawers.